N 43° 6' 0" and W -79° 3' 58"
Niagara Falls in Ontario with it's 82,000 citizens is a city in Canada about 231 mi (or 371 km) south-west of Ottawa, the country's capital city. Local time in Niagara Falls is now 01:24 PM (Friday). The local timezone is named America / Toronto with an UTC offset of -4 hours. We know of 9 airports in the vicinity of Niagara Falls, of which 3 are larger airports. The closest is airport we know is Niagara Falls International Airport in United states in a distance of 6 mi (or 10 km). The closest airport in Canada is Niagara District Airport in a distance of 8 mi (or 10 km), East. Besides the airports, there are other travel options available (check left side). Also, if you like golfing, there are a few options in driving distance. We discovered 7 points of interest in the vicinity of this place. Looking for a place to stay? we compiled a list of available hotels close to the map centre further down the page. When in this area, you might want to pay a visit to some of the following locations: Buffalo, Lockport, Toronto, Batavia and Albion. To further explore this place, just scroll down and browse the available info. Let's start with some photos from the area. 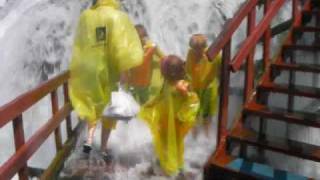 This is Part I ( of three ) of vlog about our "Getting Wet" family vacation in Niagara Falls 2009 ( Canada and NY ). There is also some video with the summer fireworks over the falls. 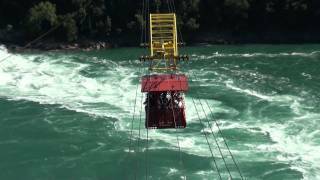 Designed by Spanish engineer Leonardo Torres Quevedo in 1913 and opened in 1916, Whirlpool Aero Car offers a fantastic view of Niagara's Whirlpool, the Gorge, and the Falls about three kilometers. A Walk Down at the bottom of Niagara falls. Cave of the winds tour at Goat Island Niagara Falls state park ny. 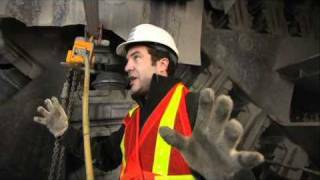 Rick mans the controls of the world's largest tunnel boring machine 450 feet beneath Niagara Falls. Niagara Falls. Поездка на Ниагарский водопад. Прогулка по городу Ниагара. Located at 43.085, -79.07 (Lat. / Lng. ), about 1 miles away. Niagara Falls is a Canadian city on the Niagara River in the Golden Horseshoe region of Southern Ontario, with a population of 82,997 at the 2011 census. The municipality was incorporated on June 12, 1903. Across the Niagara River is Niagara Falls, New York. Located at 43.1167, -79.0667 (Lat. / Lng. ), about 1 miles away. The Whirlpool Rapids Bridge, commonly called the Whirlpool Bridge, and until 1937, known as the Lower Steel Arch Bridge, is a spandrel braced, riveted, two-hinged arch bridge. It crosses the international border between Canada and the United States, connecting the commercial downtown districts of Niagara Falls, Ontario and Niagara Falls, New York. This bridge is located approximately 1.5 kilometres north of the Rainbow Bridge and about 2 kilometres from the Falls. Located at 43.1092, -79.0583 (Lat. / Lng. ), about 1 miles away. The Bridal Veil Falls is the smallest of the three waterfalls that make up Niagara Falls. It is located on the U.S. side; Luna Island separates it from the American Falls and Goat Island separates it from the Horseshoe Falls. The Bridal Veil Falls faces to the northwest and has a crest 56 feet (17 m) wide. Located at 43.0835, -79.0707 (Lat. / Lng. ), about 1 miles away. The Rainbow Bridge at Niagara Falls is an international steel arch bridge across the Niagara River gorge, and is a world-famous tourist site. It connects the cities of Niagara Falls, New York, United States (to the east), and Niagara Falls, Ontario, Canada (west). Located at 43.0902, -79.0677 (Lat. / Lng. ), about 1 miles away. Casino Niagara is a commercial casino located in Niagara Falls, Ontario, Canada. It opened in 1996, on the site of the former Maple Leaf Village amusement park. With a prime location beside Clifton Hill, it has remained open as a permanent facility. It is the first Casino in Ontario to feature electronic Roulette. Casino Niagara has over 1,500 slots and over 40 table games, as well as sports betting. Located at 43.0924, -79.0707 (Lat. / Lng. ), about 1 miles away. Maple Leaf Village is a former amusement park and entertainment complex in Niagara Falls, Ontario. Opened in May 1979 it was operated by Conklin Shows (operators of the midway at the Toronto Canadian National Exhibition). Falling on hard economic times in the early 1990s, it was restructured and replaced with Casino Niagara, a government run casino. Located at 43.0917, -79.0722 (Lat. / Lng. ), about 1 miles away. 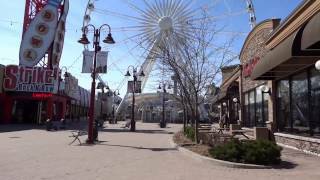 Clifton Hill is one of the major tourist promenades in Niagara Falls, Ontario. The street, close in proximity to Niagara Falls and the Niagara River, leads from River Road on the Niagara Parkway to intersect with Victoria Avenue. The street contains a number of gift shops, wax museums, haunted houses, video arcades, restaurants, hotels and themed attractions. For visitors, particularly families and teenagers, it is a major amusement area and centre for night life. Located at 43.0912, -79.0745 (Lat. / Lng. ), about 1 miles away. 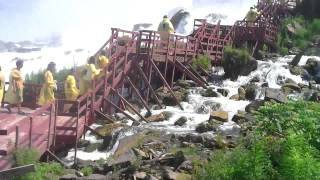 The Cave of the Winds was a natural cave behind Bridal Veil Falls at the Niagara Falls. The cave was some 130 feet (40m) high, 100 feet (30m) wide and 30 feet (9m) in depth. It was discovered in 1834, and originally dubbed Aeolus' Cave, after the Greek god of winds. Guided tours began officially in 1841, and continued until a rock fall in 1920 made it clear the passage was no longer safe. Located at 43.0834, -79.071 (Lat. / Lng. ), about 1 miles away. Niagara Falls station in Niagara Falls, Ontario, Canada is served by the Maple Leaf train between Toronto and New York City. On weekends and holidays in the summer it is also served by GO Transit excursion trains operating by way of the Lakeshore West line between Toronto and Niagara Falls. 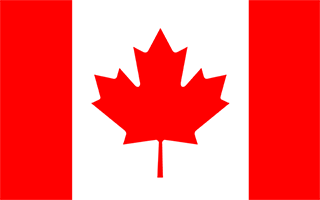 The Maple Leaf is a joint Amtrak-Via Rail service: ticketing is shared, and trains consist of Amtrak equipment but are operated on the Toronto-Niagara Falls portion of the route by Via crews. Located at 43.1088, -79.0634 (Lat. / Lng. ), about 1 miles away. The Niagara Falls Memorial Arena is an arena located in Niagara Falls, Ontario, Canada. It was built in 1950 and has a capacity of approximately 3,000. The arena was home to various ice hockey teams in the past, including the Niagara Falls Thunder and the Niagara Falls Flyers. It currently serves as the home of the Niagara Falls Cannucks, a team in the Greater Ontario Junior B Hockey League. The city has discussed building a new arena to replace it and development is well under way. Located at 43.0947, -79.0791 (Lat. / Lng. ), about 1 miles away. The Michigan Central Railway Bridge is a steel arch bridge spanning the Niagara Gorge between Niagara Falls, Ontario and Niagara Falls, New York. The bridge was designed by William Perry Taylor, Chief Engineer J.L. Delming and consulting Norwegian-born engineer Olaf Hoff. Construction on the bridge began in 1924, and the bridge opened in 1925. This bridge replaced the Niagara Cantilever Bridge that crossed in the same area from 1883 to 1925. Located at 43.1085, -79.0584 (Lat. / Lng. ), about 1 miles away. The Rainbow Tower is a 50.3 m (165 ft) tower located at the Rainbow Plaza Canadian border station of the Rainbow Bridge in Niagara Falls, Ontario, Canada. Construction on the tower was completed in 1947. Located at 43.0919, -79.0702 (Lat. / Lng. ), about 1 miles away. WWE Niagara Falls is a now-defunct wrestling-related retail establishment that was part of the Falls Avenue Entertainment Complex, which is located in Niagara Falls, Ontario, Canada and owned by World Wrestling Entertainment (WWE). It was the second WWE Retail Store to open up after The World (WWE), though it was the first WWE Retail Store to opearate in Canada and the first to open out of the United States. After The World (WWE)'s closure it became the only WWE Retail Store in the world. Located at 43.0913, -79.0742 (Lat. / Lng. ), about 1 miles away. The Maid of the Mist Incline, originally known as the Clifton Incline, was a funicular railway in the city of Niagara Falls, Ontario, Canada. The line was built to convey patrons of the Maid of the Mist boat tour, and linked the foot of Clifton Hill to the boat dock below. The line was built, as the Clifton Incline, in 1894. It was 50 metres (165 feet) long, was electrically hauled, and passengers were carried in two small 12-seater cars. Located at 43.0888, -79.0725 (Lat. / Lng. ), about 1 miles away. The Upper Steel Arch Bridge, also known as the Honeymoon Bridge or Fallsview Bridge, was located in the heart of Niagara Falls, Ontario, about 500 feet south (upriver) of the present-day Rainbow Bridge. This bridge was constructed in 1897 and opened for traffic in 1898. It was the fourth bridge on the site in fifty years. The Second Falls View Suspension Bridge it replaced was moved downriver to Queenston, where it served traffic between there and Lewiston, New York until 1962. Located at 43.087, -79.071 (Lat. / Lng. ), about 1 miles away. Niagara SkyWheel is a 175-foot tall Ferris wheel in the middle of Clifton Hill, Niagara Falls, Niagara Falls, Ontario, Canada. Niagara SkyWheel is a Ronald Bussink Professional Rides designed R60 Giant Wheel, and was manufactured by Chance Rides and supplied by Chance Morgan. It opened on 17 June, 2006, at a cost of $10 million. Its 42 Swiss-manufactured fully enclosed passenger cars are heated in the winter and air conditioned in the warmer months and each can carry eight people. Located at 43.0909, -79.0759 (Lat. / Lng. ), about 1 miles away. Luna Island is a very small uninhabited island in Niagara Falls, New York, part of Niagara Falls State Park. It separates Niagara Falls, the Horseshoe Falls and the Bridal Veil Falls. Located at 43.0833, -79.0703 (Lat. / Lng. ), about 1 miles away. Sheraton on the Falls is a 22-story Fallsview hotel located within the Falls Avenue Entertainment Complex in Niagara Falls, Ontario, Canada. Located at 43.0908, -79.0726 (Lat. / Lng. ), about 1 miles away. 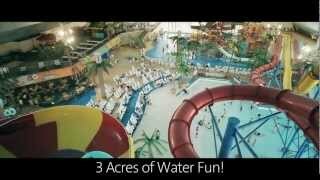 Fallsview Indoor Waterpark is located on 5685 Falls Avenue in Niagara Falls, Ontario, Canada. Located at 43.0925, -79.0706 (Lat. / Lng. ), about 1 miles away. Crowne Plaza Niagara Falls - Fallsview is a historic hotel located in the Falls Avenue 20-acre complex (which is formally known as the Falls Avenue Entertainment Complex) in Niagara Falls, Ontario, Canada. Located at 43.0919, -79.071 (Lat. / Lng. ), about 1 miles away. The Queen Street Arts and Culture District is the old downtown area of Niagara Falls, Ontario, Canada. The street is now populated with art galleries, restaurants, and performing spaces. Located at 43.1066, -79.067 (Lat. / Lng. ), about 0 miles away. 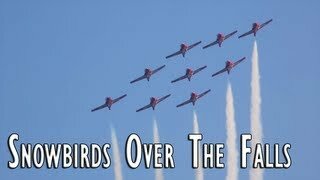 Bird Kingdom, is located in the tourist district of Niagara Falls, Ontario, Canada. Previously the home of the Niagara Falls Museum, the building was re-opened as a free flying aviary in May 2003. It is now one of the largest indoor aviaries in the world, encompassing approximately 45,000 square feet, and it houses over 300 individual birds, the majority of which come from Australia, South America, and Africa. Located at 43.0925, -79.0683 (Lat. / Lng. ), about 1 miles away. The Criminals Hall of Fame Wax Museum is a wax museum on 5751 Victoria Avenue in Niagara Falls, Ontario, Canada. One of many wax museums in the region, it is located at the top of Clifton Hill. The museum features forty wax statues of notorious criminals, from mobsters to serial killers. The museum was created in 1977 and has been open ever since. Located at 43.0919, -79.0765 (Lat. / Lng. ), about 1 miles away. Oakwood Cemetery in Niagara Falls, New York was founded in 1852 after land was donated by Lavinia Porter. It covers over 18 acres (1 km²) and over 19,000 are buried there. Notable graves include first person to travel over Niagara Falls in a barrel Annie Edson Taylor, Judge Augustus Porter, and first person to swim the English Channel Captain Matthew Webb. Oakwood is seeking a position on the National Register of Historic Places. Located at 43.0968, -79.0499 (Lat. / Lng. ), about 1 miles away. These are some bigger and more relevant cities in the wider vivinity of Niagara Falls.